After going to Ceuta port to find out the ferry times I paid a quick visit to the tiny Ceuta Star Brewery. I had a quick cana of their Pale Ale before packing my bags for the boat. The ferry to Algeciras takes only an hour and once there I took a bus to La Linea where my friend Sean was waiting for me at the station. La Linea is the first town after the border to Gibraltar and while on a map it seems like the same urban area there is a dramatic difference in culture between the 2 towns. Myself and Sean walked up the Med steps to the summit of the Rock of Gibraltar before heading out for dinner with his girlfriend Maeve. I managed to get a free bike box in one of the La Linea shops which took a bit of stress away ahead of the flight home. The next morning after breakfast I had my final cycle of the trip up the Rock of Gibraltar. Despite being less than 4km it really is a brutal climb with ridiculously steep gradients. I took it very easy for the rest of the cycle and got a few photos with the monkeys. 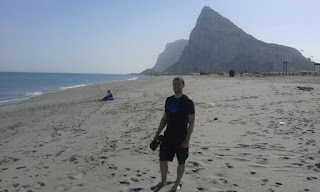 A few days relaxing in Gibraltar was a great way to end the trip after the tough climbs and general chaos of Morocco. Morocco is a great cycle tour destination but if you don't like climbing hills it's best done on a motorbike. The best cycling was in the Atlas mountains on the way to Marrakesh including Tizi-N-Test, the climb over Tizi-N-Tichka and descent into Ouarzazate on the route of 1000 Kasbahs and finally the 2 days spent cycling from Fes to Chefchaouen.